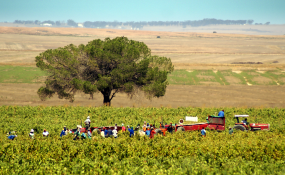 South African farm workers at harvest time. The rights of workers in South Africa have been clearly defined since the end of apartheid. Yet many farmhands who work on citrus plantations or in vineyards in the west of the country experience something very different in their everyday lives. "Workers' rights are not guaranteed," says Benjamin Luig, one of the directors at the Rosa Luxemburg Stiftung, a left-wing German political foundation that offers political education both at home and abroad. "Exploitation is rampant and the relationship between those who run the farms and the employees often resembles feudalism. A lot happens through pressure or threats because many of the workers live there with their families and, so, are dependent on their employers," he told DW. Luig recently visited a citrus farm, where he witnessed a pregnant woman in her third trimester complain about not being allowed to take a break. He also noted that many of the workers' corrugated iron huts stood only three or four meters away from the fields where toxic pesticides were being used. "Even the best product certification won't help this problem," Luig said. Europe plays a role in fueling these poor working conditions. "The supermarkets at the end of the chain of delivery determine the price," Liug said, pointing to the enormous pressure on producers. According to Luig, this is why it's all the more important for greater government supervision and more training for unions. He also wants the ILO to uphold its commitment to social justice and humane working conditions. The International Labour Organization (ILO) turns 100 years old on April 11. From the beginning, its plans were as visionary as they were ambitious: Governments, employers and unions should define the international standards for the labor market together. Not only that, but they should also ensure these standards are upheld. The conditions that followed the First World War help explain why industry and government representatives were open to the idea of firmly establishing social justice in the early days of the League of Nations, the predecessor the United Nations. In the shadow of the October Revolution of 1917, workers' movements were gaining influence everywhere. Peace in Europe was unthinkable without making concessions to the unions. The ILO has a number of important achievements and improvements it can look back on, says Luig. He recalls the implementation of the right to assembly in the agricultural sector in 1921 - a huge improvement in a sector whose conditions had been almost "slave-like" even when industrialization began. Pointing to the ILO's track record in the 1990s, Luig criticized the UN's labor organization for going along with neoliberal thought, supporting so-called structural adjustment programs and believing that the markets would take care of everything. "But the ILO has become more active in recent years, particularly in the areas of child labor and general working conditions," he said. On its 100th anniversary, the ILO is focused more on its future than its past. With its initiative, "Future of Work," it intends to shape changes in the labor market with an eye on social justice. Including in Africa, according to Peter van Rooij, the ILO's deputy regional director for Africa. "Youth unemployment is a huge challenge. Africa is a young continent and technical training is important," he told DW. "More and more teenagers can't get a job when they enter the job market," said van Rooij. Van Rooij stresses that there's still a lot to do when it comes to offering prospects to teenagers [across the African continent]. One of the consequences of youth unemployment is that the number of migrant workers is rising as young people leave their countries in search of a job. "We have to work in more specific terms with the industrial sector and the countries workers are emigrating to," he said. The increase in economic migrants is posing new challenges for the ILO in terms of social protections. According to Ethiopia's Labor and Social Ministry, an estimated 460,000 emigrated from Ethiopia to Saudi Arabia, Kuwait and the United Arab Emirates between 2008 and 2013. The vast majority of them were women, who work as cleaners. ILO research indicates that many of these immigrants experience bad work conditions and have no access to social protections even though the ILO's agreement for economic immigrants make the same provisions for citizens as for migrants. That includes salaries, welfare benefits and legal rights, for example in the case of illness or pregnancy. The UN organization has been exercising influence on political decision makers and supporting projects aimed at improving conditions on the ground in order to implement these standards. The ILO's mission is ambitious, even 100 years after its founding. In many places, there are still large gaps between norms, laws and the reality of the situation. Looking back at the ILO's track record over the past century, van Rooij sees "many positive changes." But, as he sees it, "there's still a lot to do."